Friday, November 22nd, 2013 at 8pm, New Center for Psychoanalysis (address below). Free admission. On this day, the 50th anniversary of the Kennedy Assassination, NCP presents a one-man show by actor and author Jamey Hecht, “LIMOUSINE, MIDNIGHT BLUE: In Memoriam JFK.” The script is from Hecht’s book, Limousine, Midnight Blue: Fifty Frames from the Zapruder Film (Red Hen Press, 2009); the live performance is directed by Charles Pasternak, accompanied by a multimedia sight and sound projection. Imagery of the murder and visuals from the verse are offset by footage from presidential interviews and speeches. Epic tradition—i.e., Homer, Dante, Milton—shares the stage with science, religion, and popular culture. Hecht is a classicist, born in 1968, taking advanced training in psychoanalysis at Los Angeles’ New Center for Psychoanalysis (NCP). The production will be in NCP’s beautiful facility on Sawtelle Boulevard in West Los Angeles. Extracted from a series of sonnets on the JFK assassination, the mixed-media show sizzles with dramatic power. 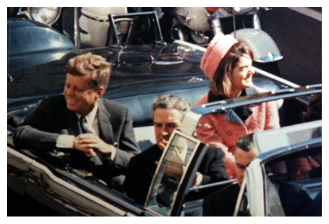 Hecht first reacts to the horrific “Zapruder Film” of JFK’s death and then inhabits the spirit of the slain president who meditates on his own life and sudden end. The assassination is a shared cultural trauma whose impact is still felt. “Psychoanalysis looks beneath the surface and into the depths–both the Inferno of myth, and the Hell of a violent world. Repression–whether in a person or in a whole society–buries intolerable truths, at a terrible cost that can prevent peace, stability, and insight”, explains Hecht.